As this list grows, recent becomes relative. Ita v&emacr;r&omacr;. 2014 to the present may well be called my Parsonsfield years. In the wee morning hours of 30 January, Folk Alley awakened me to their music. "Got Right Now", a hand-clapping, storytelling tune, the lyrics of which I later discovered were inspired by a West Virginia grandmother, captured my heart and soul. In February, their music energized me homeward on an over-ambitious cross-country skiing adventure. Mid-April, we met for the first time at Purple Fiddle in Thomas, WV, somewhat of a second home for the boys. A delayed showtime at an August outdoor festival in Chillicothe, OH, gave us practically an entire day for lengthy chats. The boys lured me in December to their opening Toronto performance as roving minstrels in The Heart of Robin Hood, a Broadway-ready theatrical production for which they wrote the music. I returned in March 2015 for several more performances. My Parsonsfield years have now included camping, sightseeing sidetrips, holiday tours, mountain climbing, trail running, PRT rides, lots of coffee shops, and more than 100 shows. 2018 even included -- finally -- a Morgantown show at 123 Pleasant. What's next, boys? You own my heart. Montani Semper Liberi Redux and On the Road from Morgantown to La Hermandad: two writings quickly published in three days in April 2014. 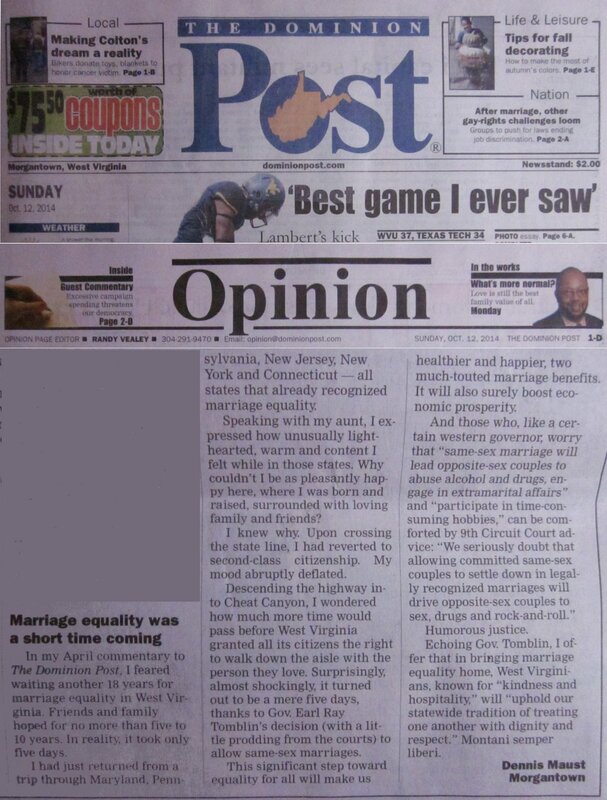 The former, a Dominion Post guest commentary, was published as "Joining union again". The latter, "On the Road from Morgantown to La Hermandad", was a blog post for Firsthand Coop, a labor of love for good friends and good coffee. October 2014 saw me writing an unexpectedly quick follow-up opinion letter to Montani when civil marriage equality arrived in West Virginia. Returned to my roots in 2013 -- roots being family and Morgantown. The ship set sail, actually, in late summer 2012, with casual interest in Morgantown homes and affectionate family prodding. By Thanksgiving, I had closed on the fairytale-like third, "just right" home. All details except signing the papers were crazily conducted from Dallas. I returned to my Dallas condo after Thanksgiving not knowing what to do with it. Keep it as a second home, become a landlord, or sell? We tested the market in late January 2013. Boom. We were under contract in 3 days. I felt as if the Phaeakians were whisking me home! We closed in 30 days. I was not ready to move. But it happened. Now, somewhat like Odysseus who was 20 years away (for me, nearly 38 years), this long-lost journeyman must reacquaint, reconnoiter, and rebalance. St. John's College Santa Fe continues to be a lovely, if not exactly annual, summer destination. After two "introductory" weeks in Summer Classics (one each in 2003 and 2004), the next four years consisted of eight-week summer semesters enroute to a Master of Arts in Liberal Arts (2005-2008), a Great Books program. Segments: Literature; History; Math and Science; Politics and Society. 2009 marked a return for the optional fifth segment (Philosophy and Theology) but was sadly cut short. Summer 2010 found me reading Cervantes and Homer and working on a master's essay, its oral presentation occurring in April 2011. Summer 2011 saw a return engagement with Philosophy and Theology, and summer 2012 a Husserl precept and Ancient Greek self-study. A four-week engagement with the Greek Institute in summer 2013 was followed by four weeks of supplementary research and writing on Homer's epics. 2017 marked a return to Summer Classics. Dallas White Rock Marathon (2004). Marathon number three. Probably the last. Training is time consuming -- and the knees and feet do not enjoy lengthy runs anymore. Time to cut back and balance life a little more. Colorado backpacking (2004). Colorado in July, once again. Solo. Nine "fourteeners." Six days. Tiring. Exhilarating. Shavano, Tabeguache, Missouri, Oxford, Belford, Quandary, Grays, Torreys, Bierstadt. St. John's College Santa Fe Summer Classics (2004). Lao Tzu: Tao Te Ching, tutors, seminars, dialogue. A week with interesting wayfarers, mountains, and thunderstorms. The other 51 weeks almost pale in comparison. Colorado backpacking (2003). Colorado in July. Two friends. One tent. Six fourteeners. Five days. One canyon. One narrow-gauge railroad. Incredible. "For everything else, there's MasterCard." Redcloud, Sunshine, Handies, Black Canyon of the Gunnison, Chicago Basin, Eolus, Sunlight, Windom. St. John's College Santa Fe Summer Classics (2003). An intense, exhilarating, incredible way to study the classics. For SMU Master of Liberal Arts students, it is also a great way to earn a one-hour credit. I chose seminars on (1) Emerson essays and (2) Tolstoy short stories. Taken together, the two seminars resulted in a lot of connections between them -- and with other fountains of wisdom. San Diego Marathon (2003). What can I say? It's all about the training. This marathon was number two; Chicago on 10/7/2001 was the first. The big question: "Will there be a number three?" SMU at Oxford (2002). War and Diplomacy course for SMU Master of Liberal Arts students at Oxford, University College ("Univ"), with side trips to London, Belgium, and France visiting battlefields, cemeteries, museums, and monuments. SMU at St. Gregory's Abbey (2002). SMU Master of Liberal Arts students studying the Rule of Benedict at St. Gregory's Abbey: getting quiet, reflecting, and practicing Lectio Divina.